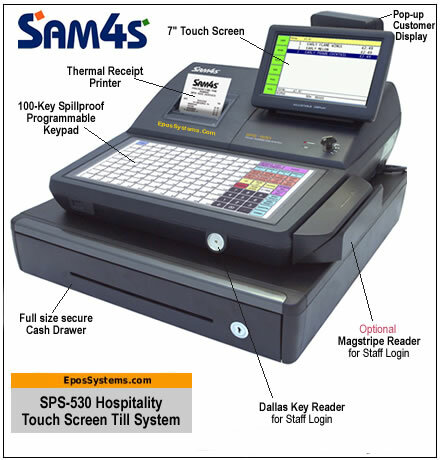 The Sam4s SPS500 series Touch Screen EPOS Terminals feature a hybrid design, combining the functions of a touch screen system within the housing and low-cost of a cash register. Sam4s has combined fast and simple ECR's keyboard entry with an intuitively bright 7" touch screen display. Sam4s is a leading international brand that is a spin-off of Samsung. Established since 1968, it supplies epos equipment in 60 countries worldwide. Sam4s has a solid reputation for build quality and reliable operation. Each machine is supplied with the confidence of a 3 year manufacturers warranty as standard with a UK-based service centre. Choose either the standard SPS530 model with a wide 80mm thermal receipt printer, or the optional SPS520 model with twin 57mm width thermal receipt and journal-copy printers. The flat 100-key keyboard lets you program your most popular food and drink menu items, whereas the adjustable Touch Screen allows upto 200 screens of colour-coded buttons to define your more sophisticated menu items. This is ideal for choosing cooking options, condiments / sauces, portion / glass sizes, pizza toppings and other order choices. 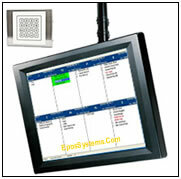 The SPS500 has integrated rom-based EPoS software which is fast, reliable and comprehensive. 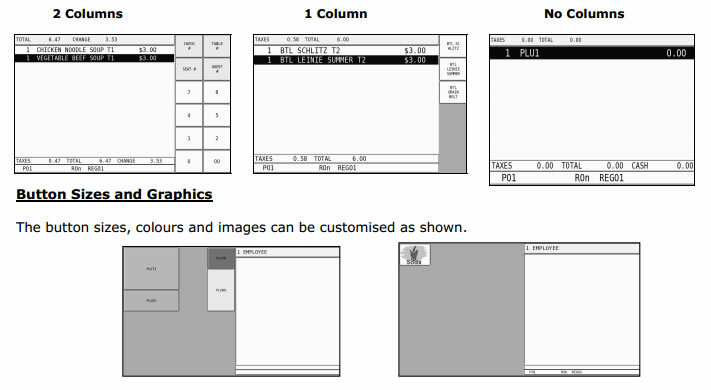 The menu and application functions can be customised by EposSystems.Com to suit your particular business requirements with a vast array of features. 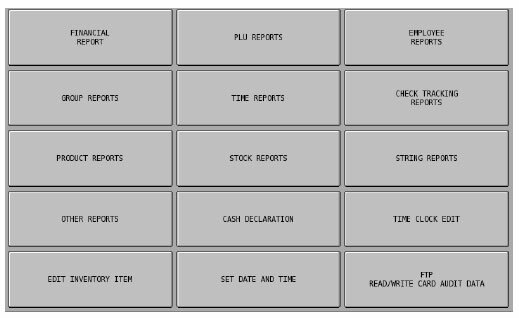 The SPS-500 has stock control function and provides a full range of sales, staff analysis and financial management reports. 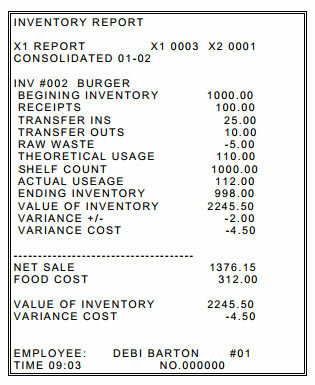 The SPS-500 from EposSystems.Com is an ideal replacement for older technology ECR's (Electronic Cash Registers), a cheaper cost-effective alternative to more expensive PC-based POS systems, and a powerful platform for independent franchises, multi-unit operators and chain stores with the ability to link back to the Samstock Backoffice system. The pack includes 3 year hardware warranty. Service Pack is required for initial set up, remote training and a 1 year support subscription. The software is provided on a permanent licence - there are NO ongoing mandatory licence / support fees. It is NOT necessary to have a Back Office system or PC to operate the system. Everything required is included in the stand-alone package. If you do wish to have remote reporting, enhanced stock control and purchasing functions, then the optional Back Office software provides these features, either networked at the same premises or remotely from any where using an internet connection and the Draytek router. The Bixolon SRP275 Kitchen Printer allows you to print preparation tickets for selected food & drink items in the kitchen or food / drink preparation area. The remote printer is connected by a secure cable connection, with cable lengths available from 2m - 50m. This impact dot-matrix printer prints on plain paper, so the printed ticket is less susceptible to heat, moisture and wet hands. The standard kitchen printer is available with a manual tear-bar so tickets can be pulled and cut off. 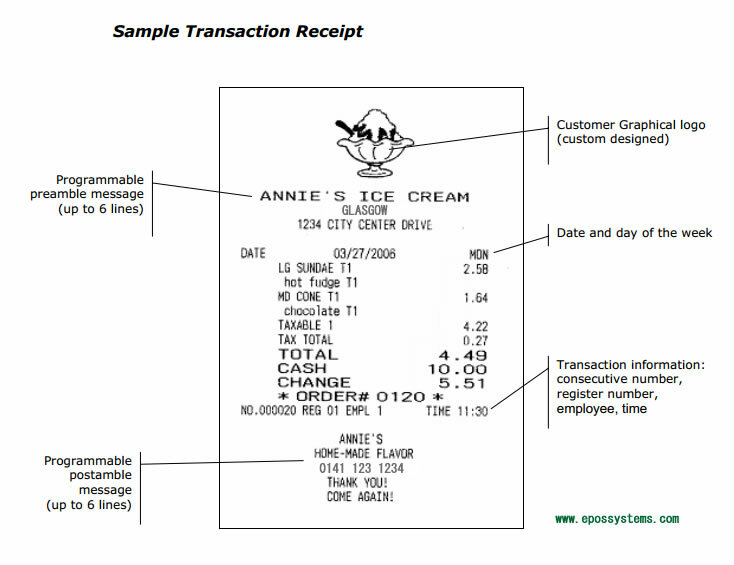 The enhanced Auto-Cutter model cuts the ticket automatically with a partial-cut allowing the order ticket to be simply lifted off the printer. 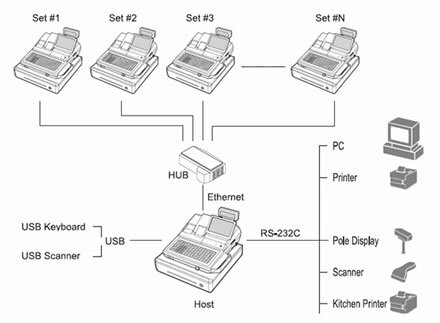 Multiple remote kitchen printers can be set up, allowing different menu items to be printed in different areas. For example, drinks can be printed on the bar printer, pizza orders can be printed on the pizza ticket printer and other food can be printed on another kitchen printer. 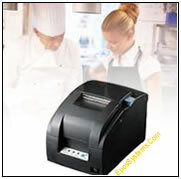 A remote kitchen printer results in fewer mistakes in a customers order. 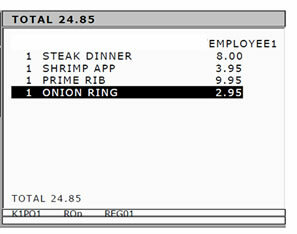 No need to shout orders down to the kitchen anymore. No need to tediously hand-write each order. So there will be fewer errors and will enable you to provide a faster, more professional experience to your customers. The Kitchen Monitor System with 19" Monitor and Aluminium Keypad is designed for fast-paced food service operations where a high volume of food and drink orders need to be handled quickly and efficiently. 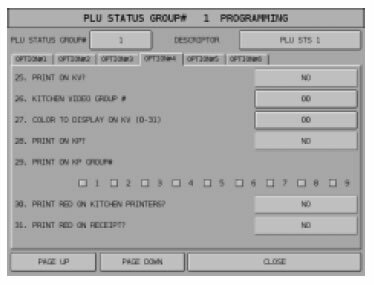 As orders are taken at the tills, they are instantly displayed on the 19" Kitchen Monitor with the order details, time of order and time passed. Processed orders are taken off using the water-proof Aluminium Keypad. Important notes can be highlighted in colour, for example, 'no onions'. 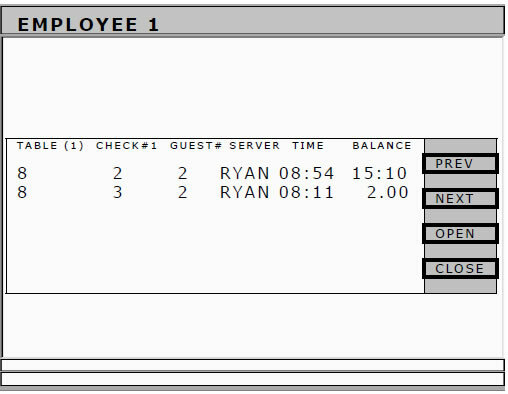 The Kitchen Monitor's screen is configured to show 8 orders at a time, and can scroll through multiple pages. A warning can be set if orders exceed a certain time limit. 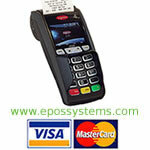 Links directly to the epos terminal for seamless processing. Card processing is subject to application for a new merchant account on a 3 year agreement with Streamline and the equipment provider, and the agreed card transaction charges in addition to the monthly terminal rental fee. Runs on your Windows PC or Laptop. Allows product / price maintenance, screen design changes, sales and profit margin reports, historical sales reports by date period and ability to schedule report by Email or SMS Text Message. (Text Message credits required). Can be connected at same premises over LAN network or remotely over the internet using our Draytek Router (£195). Runs on your Windows PC or Laptop. Provides all the features of SamLite, plus advanced stock control, supplier database and purchase ordering. * Optionally link to Weighing Scale for fruit/veg, meat, fish, salads etc. * Screen can auto-close after 1 item, or can remain till closed. NB: Product information supplied here is based on the manufacturers documentation. Features are subject to change without notice from version to version. E&OE. Friday 19-April-2019 23:08 Our office is currently closed. We will be open again from 10am tomorrow.